Now in our seventh edition, the best Mexican Independence Day party in the UK is back! This time we'll be going to the "beach" in the heart of London, at the fabulously creative & popular rooftop space, Brixton Beach, allowing you to reminisce or dream of your past & future holidays to Puerto Vallarta, Los Cabos or the Mayan Riviera. You will be treated to delicious Mexican street food by Cafe Pacifico and of course the iconic national spirit, tequila and tequila based cocktails such as the zestful Margarita. Once your belly is content, prepare your ears and soul for elation with our festival-like entertainment beginning with DJ 3rno, hailing from Guadalajara with his powerful mix of Mexican rhythmic styles blended with a heavy dose of party tunes from all corners of the globe. Ears elated yet? Now its time for our live music line-up. First up, the Latin Funkers with their contagious energy of you guessed it, funky Latin sounds. Having played for the likes of Damien Hirst, the Beckhams, MTV and BBC Radio, we'll be in good company. Finally, no Mexican Indpendence Day party will be complete without the traditional shout for independence, 'El Grito', followed by a Live Mariachi band courtesy of Mariachi Fiesta UK, that will keep the party going into the wee hours of the morning at our After Party. 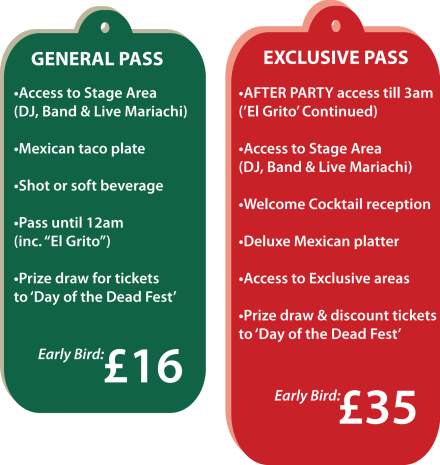 Our Exclusive Pass ticket holders have guaranteed access to the After Party downstairs in Casa Brixton, until 3am with 'El Grito' continued and Live Mariachi. A bit about us: We began in 2010 as the go-to party to celebrate Mexico's bicentennial celebrations. What was initially meant to be a party for a few dozen turned into a 450 audience turnout. Seven years later and the numbers have continued to increase as we offer an inclusive 100% authentic Mexican experience full of euphoric energy. *Please Note: We expect a sold out venue across the board for Mexican Independence Day VII, so please book early to avoid disappointment as there is unlikely to be availability on the door for the entertainment/stage area. Early Bird prices are available until midnight 12th September 2017, price will increase after that to £18 for 'General Pass' and £38 for 'Exclusive Pass'.